The “Q” phenomenon is sweeping the internet. And if you’re haven’t heard about it, I’m going to do my best to explain it. In doing so, I hope to keep it fairly simple, and offer plenty of bright shining rays of light. Because where there is light, there is hope. This is a long post, it’s complicated, and this is deep territory. You may need to take a break, or go for a walk outside for a bit. Then come back and read some more. Just breathe. When thinking about the whole Q phenomenon, I’m reminded of the parable about the blind men and the elephant. This group of blind me come upon and elephant and try to form a concept of what an elephant is. Each in turn describes a different part of an elephant. “An elephant is big and firm,” says the man feeling a leg of the elephant. You get the idea, right? That no one person has the whole picture of the elephant. And that, my friends, is an apt analogy for understanding Q, conspiracy theories, and consensual reality. So think about a group of people getting together to make (most likely) unsavory things happen. A theory is, “a supposition or a system of ideas intended to explain something, especially one based on general principles independent of the thing to be explained.” In other words, a theory is a possibility or alternative. Think about this in terms of love. Yes, love. Could you put love through rigorous scientific tests and prove that love exists? Of course not. Love is something you “just know” exists. It’s something you experience, something you live. I think love is kind of like a theory, an alternative to hate. You know the difference between love and hate because you’ve experienced both. Keep that in mind as you read through this post. Experience and feelings matter. But conspiracy theory Julie? Yes. Conspiracy theories offer alternatives, possibilities that disagree with consensual reality – with what ‘everyone’ believes is true. Sometimes conspiracy theories are wrong, and sometimes they’re right. There is debate on when the term ‘conspiracy theory’ started to infer crazy people with tin foil hats waiting for aliens to come and save or destroy the earth. Switching gears now, do you like magic shows? I enjoy them, and even dated a magician years ago. Magicians make you believe in magic by using illusion and misdirection. The greatest magicians are absolute masters of intentionally direction your attention to something they want you to see. This causes you to not see what is really going on. There’s a famous magic trick called the Metamorphosis. In this trick, the magician’s assistant is put into a bag, then locked into a box. A curtain is pulled up over the box, raised and lowered a couple of times. Sometimes the magician stands on top of the box holding the curtain. Regardless. the final time the curtain drops, the magician has ‘disappeared,’ and the assistant stands in front of you. The assistant opens the box to reveal the magician restrained just like the assistant had been previously. The truth of this trick is that it’s done with illusion and misdirection. You are deliberately deceived. The box has a false top, a false back, and the bag has a secret opening. Watch this video and learn. You’ll never be able to see this trick again and not know the secret. Or, at least part of the secret; every magician adds their own special twist to the trick. Conspiracy theorists posit that aspects of our world are a deliberate ruse – as well planned and elaborately executed as this magic trick. And if that’s the case – if conspiracy theorists are correct even in the slightest bit – then this kind of ‘magic trick’ manipulation has potentially existed for a very, very long time. I imagine you’d agree that the internet changed the world. Perhaps most importantly, the internet connected people. That connection is local, global, and instantaneous. The connectivity makes it easy to see and detect patterns and symbols like The Mandela Effect, and various so-called Illuminati symbols like upside down pentagrams, all seeing eyes, owls, obelisks, and eternal flames. The internet connectivity makes detecting ‘fake’ news easy. Comparing notes and reading multiple websites, people quickly noticed that mainstream media (MSM) behaves like a mockingbird. It copies and repeats, changing the song just a little bit, yet the message remains the same: trust the illusion, believe in the magic. To push the analogy a little further, the connectivity of the internet enabled people to see through the mockingbird illusions at who or what is “behind the curtain.” Basically, the internet is Toto in the Wizard of Oz, pulling the curtain away for all to see what’s really going on. Say what you will about Trump, but hear me out. The build-up to the 2016 presidential election was relentless. No matter where you turned, someone was talking about politics. There was no joy in anyone’s eyes; we just wanted it over with already. I don’t know about you, but I had a gut feeling that Trump’s victory had a deeper meaning that I just couldn’t see – or wasn’t allowed to see. If our world is designed as an illusion, the election may have just been smoke and mirrors anyway. And the ‘wrong’ guy won…the guy who no one in the mainstream media thought could win did win. But since the election, a curious thing has happened online. People who might never talk in real life started to talk online. They started to come together and discuss everything – all the ‘weirdo’ conspiracy theories like how the deep state runs everything, how 9-11 was an inside job, how there was more than one JFK shooter, how the PizzaGate scam was actually real but deliberately covered up, and whole lot more. And slowly, our doors of perception started to be cleansed. The curtain started to move aside as that pesky little dog, Toto, sunk his teeth in. There are many theories about who Q really is, but for this story, you don’t have to know the answer to that question. You DO have to understand that Q started to drop clues – also known as breadcrumbs. Hansel and Gretel is a simple story of two children who follow a path of bread crumbs to a candy cottage. They are captured by a cannibalistic witch who keeps Hansel in a cage and makes Gretel her slave. The children escape by outwitting the witch. The Q phenomenon alludes to the idea that, with the internet, we the people are now capable of outwitting the witch AND sinking our teeth into the curtain to reveal the truth. Regardless, “Anons” – regular folks like you and me – rapidly followed the initial breadcrumbs and began to use their collective knowledge to piece together the parts of an intriguing picture…and one that fit with many conspiracy theories. The theories seemed to tie everything together: government, entertainment, commerce, military, medical, science. And they tie into things that you and I (the relatively good and normal people of the world) really wish weren’t true like pedophilia, human trafficking, cannibalism, human sacrifice, and more. Here’s a simple example. 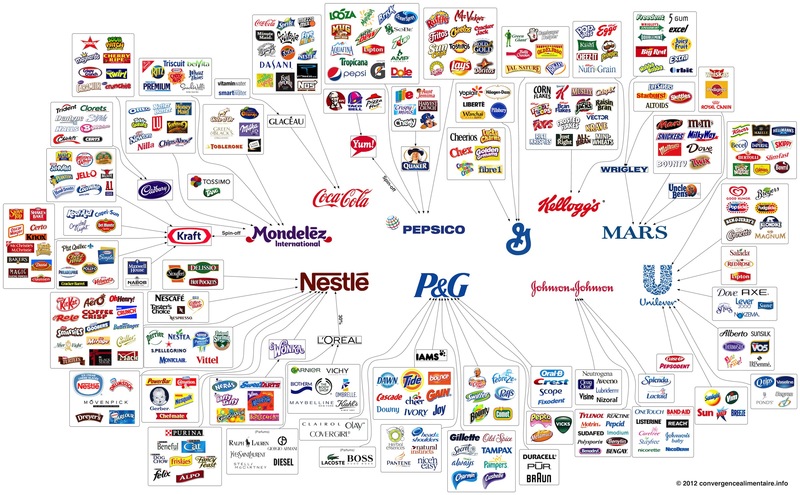 Do you find it kind of odd that ten companies own so many brands? The map is by Dylan Louis Monroe. Read more about it here. Crazy, right? And it ain’t just corporations: It’s everything. Try a simple search of Twitter for Qanon, also. There are plenty of others, just go looking. I think the coming of Trump didn’t portend a civil war. Instead it brought a secret, silent war that is (apparently) focused on ending decades of rule by a small percentage of people. It’s a war you can glimpse at if you follow Q’s breadcrumbs. It’s a war played out behind the curtain, with Q allowing you glimpses along the way. For a completely different perspective, astrologers have noticed that stars are aligned at the same positions as they were in The American and French Revolutions. If you have been waiting for changes, they are coming. And you, me, and everyone else will design the results of these changes. What was that war about? What did the Founding Fathers fight for and intend? What did they do right? What did they do wrong? Where can we do better? Where are we aspiring for freedom and independence on one hand, but causing repression, hurt, or injustice on the other? The first event she talks about is 1773 Pluto in Capricorn at 21 degrees: that’s the Boston Tea Party, the ‘culmination of a resistance movement” against the taxation of tea. That exact degree isn’t repeated until 2019, yet we are starting to feel the effects already as tensions are building. Frankly, if you’re not already feeling tense just reading this post, I’d be surprised. That’s what the Q phenomenon is about: revealing hidden stuff. Lots of it. And starting a conversation about what to put in place once the hidden stuff is out in the open. The Pluto in Capricorn transit continues through to 2036-2037. Frankly, the transformation of our world is only just getting started, and WE get to make it happen. These things I’ve talked about are all tiny cracks in consensual reality. They shine a light on a collective Pandora’s Box that holds some might ugly things. Don’t look away. Don’t stick your head in the sand and say, “oh no not me.” We are all in this together. And by and large, we are good people. We love our families, neighbors, communities, children, and have dreams about the future. We love our pets, your pets, and all of nature. We have many differences, yet we strive to listen and respect those differences. We care deeply. As the years move forward, remember these things. Remember love and free will, and kindness and caring. Act on forgiveness. Reach out. Q often uses the phrase, “Where we go one, we go all.” We are all together in this. “All for one, and one for all.” We are the musketeers. We are the ones we have been waiting for to transform our world. You, mean, and everyone else will design this new world together. Now, with all of that information. Breathe. Remember love? That thing you can’t quite describe, but know it when you feel it? Feel it now. Remember beauty.